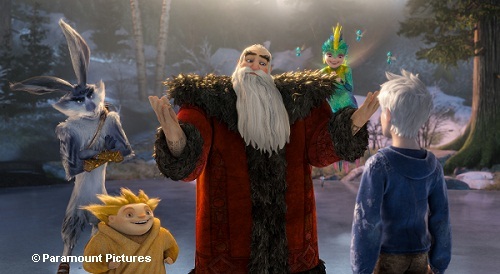 What do you get when you combine Santa, (Alec Baldwin) The Easter Bunny, (Hugh Jackman) The Tooth Fairy, (Isla Fisher) The Sandman and Jack Frost (Chris Pine) all in one story? You get a team of heroes known as “The Guardians” in one epic holiday film. Hollywood Junket attended the domestic and international press conference and spoke with the writers, director, producers, composer, and talent of Dreamworks’ latest 3-D film, “Rise of the Guardians.” Immediately one felt the sense of appreciation everyone had to work on the project. As Executive Producer Guillermo del Toro pointed out, he was very proud to share the experience of making this film with such an amazing team. The storyline centers on the “Guardians” as representatives for children’s hope against conquering the evildoer Bogeyman, Pitch (played by Jude Law). 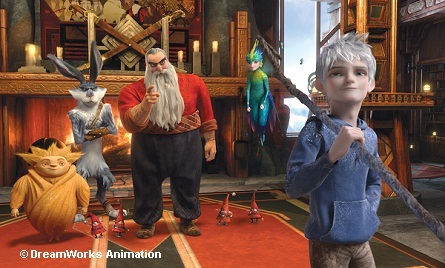 While conquering fear, they learn the all-important lesson about believing in oneself and others, especially for the main hero of the story, Mr. Jack Frost. The film is based on William Joyce’s books detailing the back story of each one of these folk heroes. But in a unique twist, rather than any adaptation, the film takes off where the books left off. “I didn’t want the movie to compete with the books,” Joyce said. It is also interesting to note that the animation of each of the characters is not the typical “cutesy” look that most children’s holiday characters have. Pitch is truly scary-looking; as would most kids imagine the Bogeyman to be. Santa is known simply as “North,” with very realistic strong features and an accent somewhat Russian in nature! Baldwin, who portrays North, said that it was this realism to the characters that attracted him to the part of playing Santa this way. And his take on the accent was undoubtedly a true testament to the talented actor. The Easter Bunny is a tall six foot-one Australian rabbit carrying a boomerang the whole time! According to producer Christina Steinberg, after casting Jackman as the Easter Bunny, it inspired them to simply go with the notion of making the world’s most famous bunny Australian after all! “Believing in a team and in others is rewarding,” del Toro remarks about the film’s theme, which quite aptly mimics the feeling the talent and crew felt in bringing this story to life on screen. “Each one of us is a ‘Guardian,’” del Toro pointed out. I guess it is up to each one of us to figure out how. ****A video game available around Nov. 23rd for Thanksgiving weekend as well.